There’s nothing worse than finding a puddle of liquid under your car. Your car has a lot of different fluids inside it. Some are more commonly leaked than others. At Jordan Motorcars San Antonio, we’re here to help you learn about the fluids that are more likely to leak out of your vehicle. It’s common for a car to leak water. You might also notice a dark, thick liquid, which is likely engine oil. Sometimes, you may even notice coolant, which is coming from your radiator. The color and smell of the liquid will make it easy to identify it. If you notice any kind of liquid leaking out of your car, it’s important that you identify it. Certain liquids may impact the way that your vehicle handles or operates. 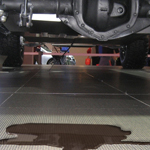 Once you see a liquid leaking out, it’s best to get your car in for a service appointment.